The Victoria whale-watching package for groups staying on our estate will be a memorable highlight of a visit to Vancouver Island. So we have created this package for our guests with Five Star Whale Watching. Relax at Saanich Peninsula accommodations - vacation rentals just north of Victoria in a magnificent country estate with a heated pool, hot tub and gazebo surrounded by well-groomed perennial gardens on 13 acres in a natural forest setting. The home has elegant antique furnishings, several rooms for varying activities and accommodates up to 18 persons in 7 bedrooms plus a sunroom. Enjoy dining in the well equipped kitchen and dining areas of the home or barbeque on the large wrap-around deck overlooking the gardens and pool area. Victoria Garden Estate is the perfect place for family vacation rentals, retreats, or corporate meetings in North Saanich on the Saanich Peninsula. 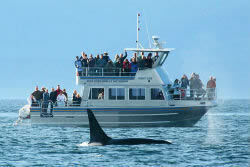 You'll enjoy quality accommodations, private meeting space and can opt for this unforgettable whale-watching adventure. 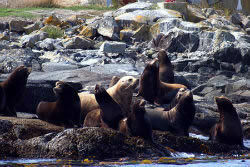 Five Star Catamaran Whale Watching has been providing Victoria whale-watching tours since 1985. On these memorable trips you will see a selection of Vancouver Island wildlife including orcas (killer whales), humpback whales, perhaps a grey whale, porpoises, harbour seals and sea lions, and many species of marine birds. Our experienced crew will make your trip informative as well as thrilling. The purpose-built catamaran accommodates up to 40 people, providing a fast yet smooth and stable ride and has four viewing areas with 360 degree panoramas. 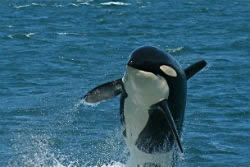 A memorable 3 hour whale and marine wildlife tour, daily 10am and 2pm. Complimentary items to make you more comfortable: warm jackets, complimentary coffee and hot chocolate, an inside cabin that can be heated when it gets cold out, and an onboard bathroom. Use the binoculars, and hear the whales on the hydrophones. Learn from two naturalists on board and refer to the whale identification books. Book this memorable package by adding $95 per person plus tax to your stay at Victoria Garden Estate between June 1-Sept 30. © 2007-2018 Victoria Garden Estate. All Rights Reserved.